What is Share & Raise? Share & Raise is a crowd funding website for everyone that needs to raise money, this can be for medical causes, your pet, your friend, business project, event, everything what matters to you the most. Share & Raise made it as easy as possible for everyone to make a fundraiser, we do not have a limit on the amount you can raise, in fact you can put a goal and when you reach your goal you can collect more money. There is no limit! How does Share & Raise work? To make you fast and easy understand how it works we have created a special explainer video that covers the main elements you need to know, before you get started, after that you only have to follow the simple steps and you raising money in 10 minutes or less. Now sit back and look at our explainer video it only takes 1 minute 35 seconds to understand how it works! We're really passionate to help people reach their goal, we believe that something small can turn into something big. We think that a website should be easy to navigate that the process of making a fundraiser should be as easy and fast as possible, that's why we are trying to make the browsing of our website as pleasant as possible for you. 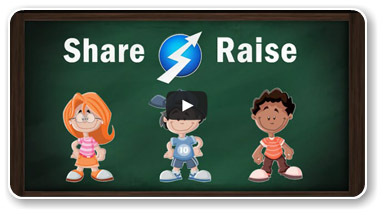 We are not like other sites, whereas if you don't reach your funding goal you will earn nothing, ShareandRaise.com gives you the option of keeping all the money that you raised, besides that we advertise a lot online for to make sure that we attract enough donators for everyone. NO waiting times of 24/48/72 hours, we try to respond in less than 1 hour. Can i make more than 1 fundraiser? Yes you can, if you have more causes you want to cover you welcome to do it. You can make unlimited fundraisers with us for many different causes. However, we recommend to concentrate on one fundraiser at a time. No Deadline: You receive your donations in real time. We do not have a minimum amount to raise in order to keep your funds. To make it simple, someone donates $100 you will receive a message of the donation and before you realize it, it's in your PayPal account. With Deadline: You receive your donations when you reach your deadline. example: You have set your deadline at 90 days. After that day you will receive your funds in your PayPal account. How long does a fundraiser last? Personal fundraisers can select or they want a time limit/deadline if they select to have a time limit/deadline the maximum is 120 days, if you select not to have a time limit/deadline your fundraiser runs for a maximum of 1 year, there is an option to deactivate your fundraiser anytime you like. All other fundraisers have a time limit/deadline up to maximum 120 days. Personal Fundraiser: You able to set a deadline or no deadline. Project, Products & Other: You can set your deadline up to maximum 120 days. Can I use photos and videos? Yes you can as long as they not copyrighted by someone, you can only use copyrighted material if you own the copyright or if the owner gave you permission to use the material. This applies to images, music, video, and text. We recommend to make everything yourself. Yes you can, keep in mind that the costs are for you so make sure the costs are not too high. Perks/Rewards is a great and unique way to attract more contributions and it will make your fundraiser more interesting to potential contributors. For example a limited t-shirt, a music CD or some sort of download can make potential contributors decide to make a donation to your fundraiser. Can people leave a comment? Yes they can, they can make a comment to your fundraiser and tell you what they think about it. people should log in first before they able to make a comment. Can I make updates to my fundraiser? Yes you can make updates to your fundraiser, you can add text, photo, etc. we even recommend to make frequent an update to keep people interested and updated about your fundraiser. It is the project's creator sole responsibility to make good on all promises. This means you offer rewards/perks in exchange for contributions, you should make sure the reward/perk gets delivered. Any tips or suggestions to make a successful fundraiser? 1. How To Make Sure To Successfully Raise Money With Share & Raise! When I set my fundraising goal, can i change it? No you cannot, Make sure you set a reasonable goal for your campaign, even if you reach your goal you can collect/raise more money, if your fundraiser has a deadline, you can raise funds until the deadline, even if you reach your goal before the deadline. Can i use the social networks to spread the word? Of course you can and you should, why we named us Share and Raise? How more you share how more you raise, and you can ask your friends to share your fundraiser link to their friends, keep in mind this is all included in the steps we prepared for you! Do my donators need a Share & Raise account? No, they just need to enter the amount they going to donate, their name, email address, and zip code. They don't even have to have a PayPal account, because they can donate with a credit card. Can i edit my fundraiser after creating it? Yes, you can edit some parts of your fundraiser. You can NOT edit: Your title, description, brief, goal, category and purchased perks/rewards information. How/When do I receive my donations? When you setup your fundraiser and shared it with your friends and family on Facebook and Twitter, relax, and wait for the donations to come. When someone makes a donation to your fundraiser using their PayPal account or a credit card, If your fundraiser is running on a deadline you will receive your funds at the deadline, if your fundraiser is running without a deadline you'll instantly receive those funds in your PayPal account. When you don't reach your goal you keep the money you already raised and you can try it again. To have more information on the fees when you reach your goal and when you don't reach your goal go here. Can i donate to my own fundraiser? Yes you can and we recommend it, like this people see you really support your own fundraiser, to donate to your own fundraiser just log out and make a donation. Do I need an account to make a donation? No, you do not need to have an account with us to make a donation, donations can be made by Debit or Credit Card and by PayPal account balance, we do recommend to sign up for an account. It is secure. 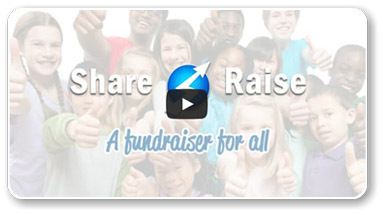 Share & Raise uses the trustworthy services of PayPal to manage all money transfers. PayPal process all of the transactions. Can i donate anonymously ? Yes you can donate anonymously, when you click the "Contribute" button you can select under Privacy "Identity-Only: Show your (or their) name, but hide the amount." or you can check "Anonymous" - Your information will be hidden from the public, Your donation will still show up but under the name "Anonymous". No, there are no fees for contributions/donations to a fundraiser. How can i get featured in your frontpage slider? Our team decides which fundraiser is worth to be featured in the frontpage slider, if you do your best you probably will be featured and have more exposure. What if i have a question that is not listed here? That's bad luck, No, you can contact us 24/7 and we will respond between 5 minutes and a few hours! To contact us click here.